Back jac 2.0 presents interesting innovations over its predecessor, a model of success that combines the advantages of dorsal air chamber with the versatility of traditional jackets because, apart from the ballast system incorporated, has two zippered pockets remarkable ability. It is an interesting proposal dorsal volume 100%, with a robust but lightweight at the same time and with little transport volume. 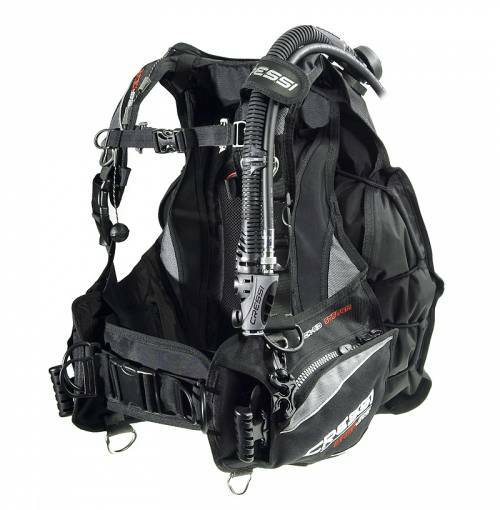 The system completely independent harness bag, now also in the area of ​​the pads, provides absolute stability chalecosobre diver and completely oppressive releases chest, axillary and abdominal area due to the expansion of sac to the dorsal area and surrounding Bottle. Abdominal area with low profile lobes. Dorsal air chamber provides the greatest lift capacity of the Cressi range but with an external stowage volume always contained, thanks to the elastic tension containment whose mission is to facilitate the maneuver additional drain. The new ballast system LAS (Lock Aid System) 2.0, it is now more integrated into the profile of the jacket and its thickness is reduced. This system, according to the Cressi tradition, ensures maximum ease of insertion and removal of ballast in complete safety against accidental loss since their anchors incorporate a spring effect (patented) in anticipation of accidental catches. Among the back pack and camera holder there are two compartments fixed ballast, very useful to define the diver trim. It combines five different tissues for suitability depending on the requirements of each zone of the jacket. Back pack is very light and semi-flexible to fulfill its function without adding weight or volume set. Completely coated padding comfortable neutral buoyancy developed in closed-cell material that prevents the accumulation of water or air and, therefore, reduces the inherent buoyancy vest and facilitates rapid drying. Its pattern and arrangement of harnesses do 100% unisex. Construction: ridge air chamber. • Base materials: Nylon © 420 denier Cordura reinforcements in pockets and shoulders. • 2 large pockets for objects with zipper. • adjustable chest strap. • Independent Harness the bag. • Sash elastic semi-independent. • Integrated System leads holder Lock-Aid System 2.0. • 2 lead pockets hidden ridges between the back pack and the inflatable chamber. • 3 valves / over discharge. • two 50 mm D-rings on the straps Inox. • 2 rings D 50 mm Inox in the lower profile. • 2 rings D 30 mm steel. on the pockets. • rigid handle transportation. • strap attachment to the faucet. • Back pack semi-rigid lightweight.